Canada, 2000, 118 minutes, Colour. Wesley Snipes, Anne Archer, Maury Chaykin, Marie Matiko, Kari- Hirouki Tagawa, Michael Biehn, Donald Sutherland. 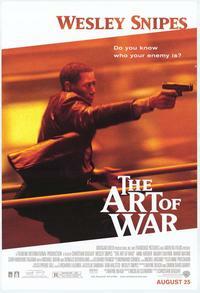 The Art of War is directed by Christian Duguay, a director of action films like Pierce Brosnan's Livewire, Aiden Quinn's The Assassin, Extreme Ops as well as two sequels to Scanners. The film is set at the millennium change. It is situated in Hong Kong as well as the United States. Issues of trade with China, right-wing politicians, big business and espionage are at the centre of the plot. Wesley Snipes is once again an action hero. Donald Sutherland is the Canadian UN Secretary. Anne Archer is the politician who is revealed as warmongering. There are the usual ingredients, flash action, editing and cutting, pace and excitement. A similar theme was pursued in Entrapment, which actually used the evening of the change of millennium for its climax. 1. The title, the traditional Roman works about war and its being considered as an art? In the 20th and the 21st centuries? The irony of the title? 2. The Hong Kong settings, 1999, the eve of the year 2000? The New York settings, the United Nations background? The action, the streets, apartments, offices? Authentic atmosphere for this kind of thriller? Musical score? 3. The situation in Hong Kong in 1999, David Chan and his business in Hong Kong, the United States, with China itself? His network? Eleanor Hooks, her role in politics, her attitude towards China? Bly and his relationship with Hooks? The setting up for negotiations, North Korea, Shaw and his work for the United Nations, the pressure on the North Korean military to negotiate? 4. The transition to New York, the passing of six months? Shaw and his relationship with Douglas Thomas, superior, orders? His going to the New York function? The Chinese ambassador, his presence, trade, the West and America and its attitude towards China? The socialising at the party? The sudden panic with the killing, Shaw and his spotting the killer? The pursuit, the action and danger? The irony of Shaw being arrested by the FBI? 5. Agent Cappella, his work with the FBI, suspicions of Shaw, his realising that Shaw was innocent, his work with the translator, Julia? His decision about pursuing the villain? 6. The Chinese Triads, their background in Hong Kong, the networks in New York City, the taking of Shaw, the attempt to kill him? His escape? On the run, his attempts to meet with Novak - and Novak's murder? The recording? Chan and Wu and the tape? 7. Shaw, trying to contact Julia, the argument for translating the tape, realising that the plotters are pursuing her? Shaw and his attitude towards Chan, his participation in the assassination, the benefits in trade that Chan would achieve because of the breaking of the treaty? 8. Bly, his work with Shaw, his being under the orders of Hooks? His killing Chan? The plan to subvert the United Nations - and her militant right-wing attitudes? 9. The confrontation with Bly, the fight, the revelation that Hooks was plotting against the United Nations? Her character, performance, public profile, prestige? The revelation of the truth? The irony of her being murdered by the Triads? 10. Shaw, the arrangement for his faked death? The romantic ending with his meeting Julia, France? 11. Popular ingredients for paperback thrillers, international politics, intrigue, the role of the United Nations, militant right-wing Americans? The action hero?